You probably landed here deep in the process of researching Sony's full frame macro lenses for E Mount cameras. Well kudos to you for researching first because amazing glass ain't cheep. My advice to you is do your due diligence; research all the options and make sure this lens is the perfect lens for you. I did hours and hours of research before pulling the trigger on this sweet baby. The Sony 90mm Macro is an amazing lens and I haven't regretted the purchase for even a second. 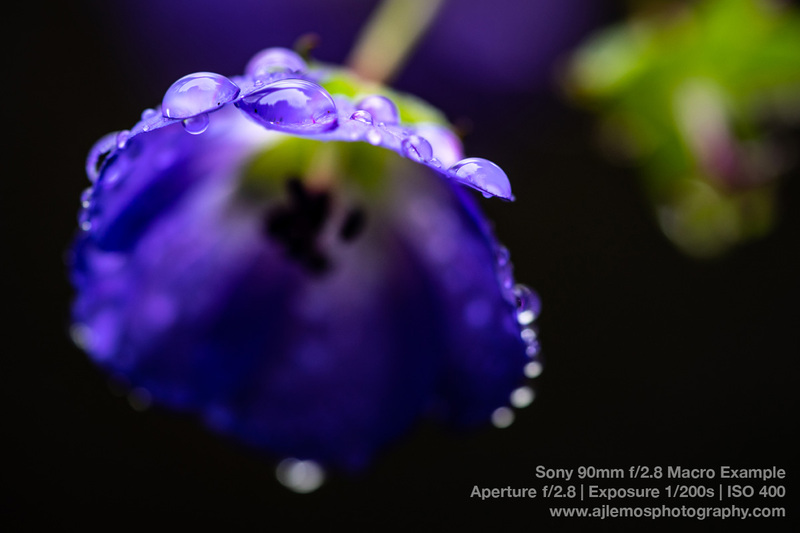 Keep reading for photo examples and an in-depth review of the Sony E-mount 90mm f/2.8 Macro G OSS lens. Why did I chose this lens? About a year ago I decided to get into macro photography. I had been inspired to try macro photography for quite awhile but was largely motivated to purchase this lens for a backpack trip I was planning in Joshua Tree, California. 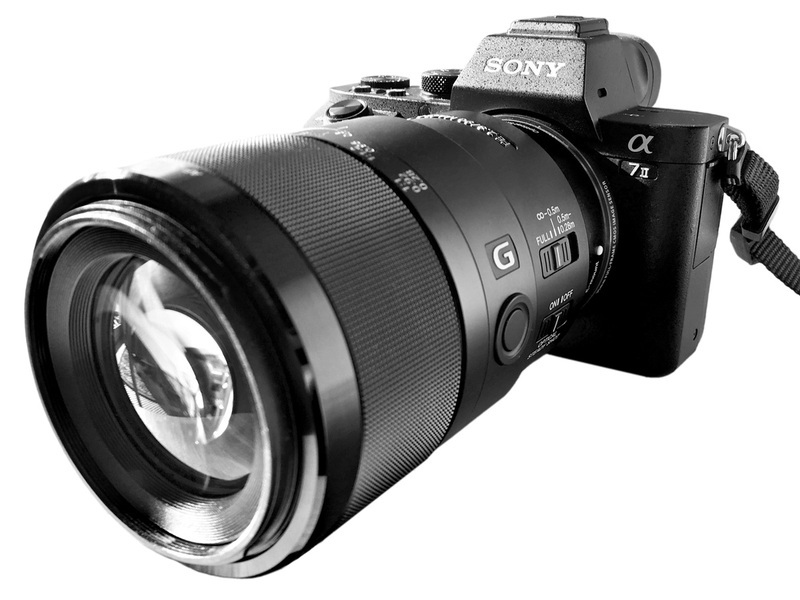 At this time Sony only makes three macro lenses for their E Mount camera series, a 30mm APS-C format, a 50mm full frame, and the 90mm full frame G series with Optical Steady Shot (OSS). I wanted to invest in an amazing macro lens that I could use for the next decade and beyond. I knew I wanted another full frame lens which immediately ruled out the 30mm. 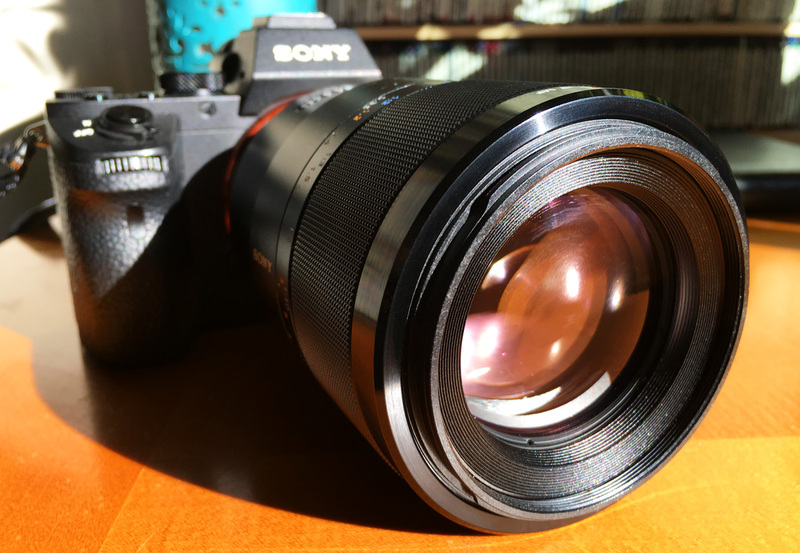 Sony's 50mm macro lens was tempting at half the cost and a fraction of the weight. 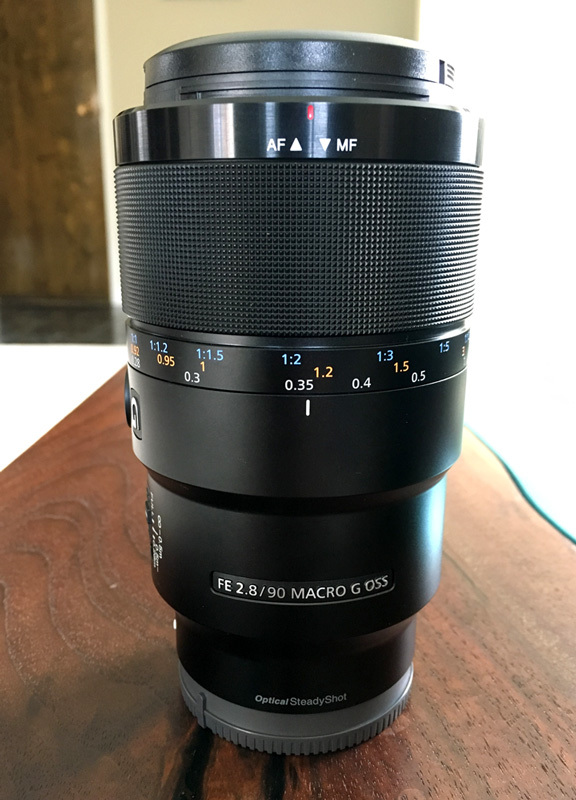 I do a lot of hiking and backpacking so weight is a huge factor for me and the 90mm macro is a hefty beast weighing in at around one and a third pounds (21.3 ounces). In the end though I decided my back could take the extra weight and chose to purchase the 90mm macro based on image quality, image stabilization, manual focus handling, and the greater working distance it offers over the 50mm. There are several other E Mount macro lenses that are not manufactured by Sony and I strongly encourage you to research them all to see if any are right for your needs. Additionally, there is a huge range of E Mount lens adapters that can make most macro lenses compatible with an E Mount body. 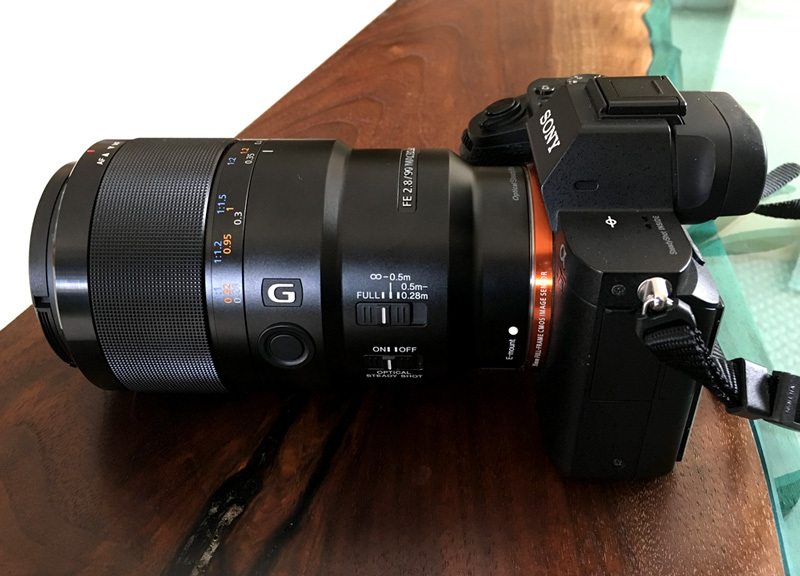 Personally, I didn't want to mess around with an adapter or the extra weight it would add to my kit, and since I am quite happy with my Sony 70-200mm G series lens I decided to stick with Sony and get the 90mm G series OSS. Below is one of the first photos I took with this macro lens. I used a tripod, manual focus, and aperture priority mode at f/2.8. It was a bit overcast after a wet morning so semi-auto mode set the exposure to 1/80th of a second with a 320 ISO. 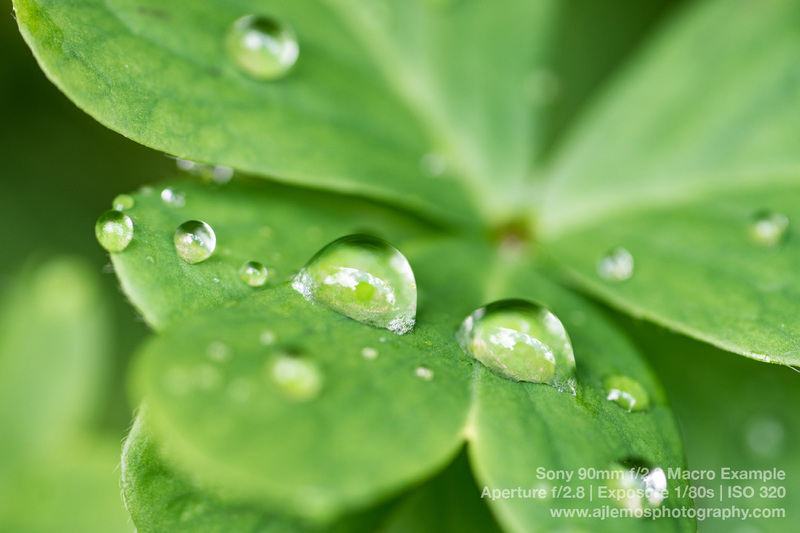 I ran back inside and threw the shot on my computer monitor and was immediately stoked with the crispness of these little clovers with tiny water drops on them. Research on this lens's sharpness will tell you it is incredible. This bit of information is the main reason I went with the Sony 90mm Macro over all of the other options. After about six months of experimenting with this lens I can wholeheartedly confirm that the sharpness is in fact totally incredibly amazingly super-duper-duper awesome sauce. 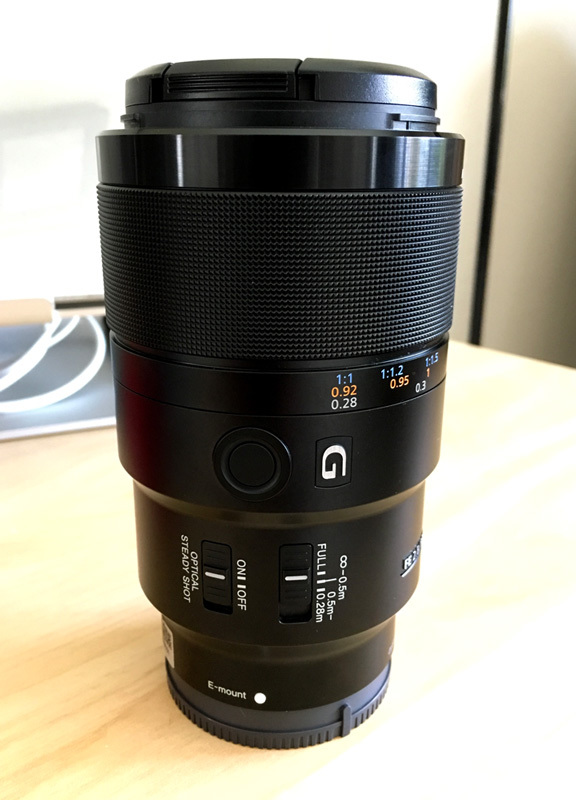 Equipped with this lens I find the only thing that may be holding back my macro photography is my a7ii sensor itself. 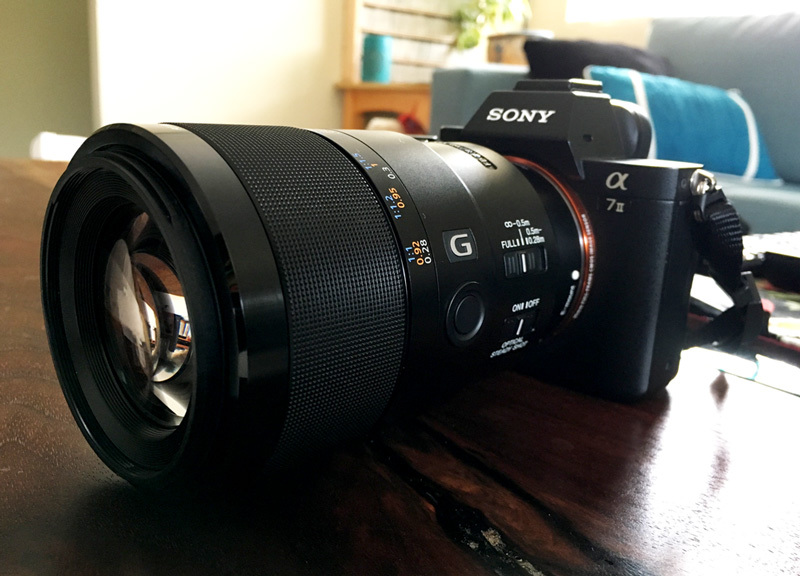 Slapping this lens on an a7Rii or a7Riii should yield some stellar high resolution macro photos. 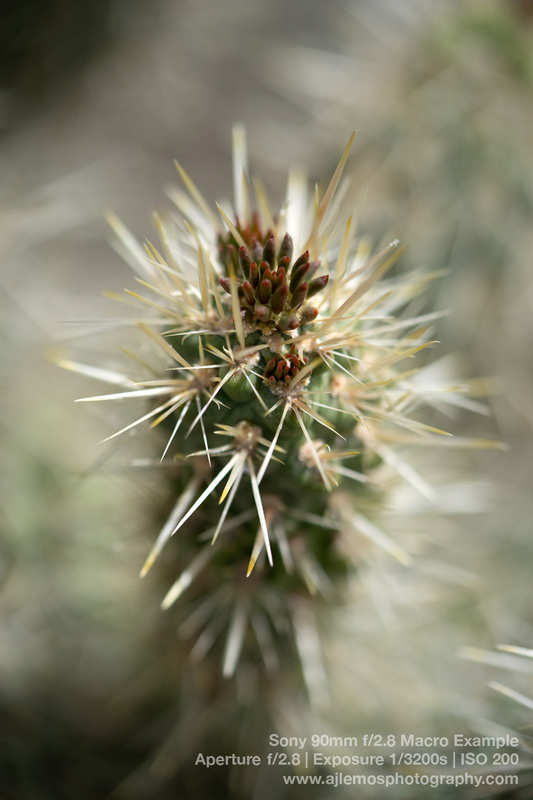 Here is a hand-held shot of a cholla cactus in Joshua Tree. This was captured on an incredibly bright desert day allowing a 1/3200th of a second exposure at f/2.8 for maxim depth of field. The f/2.8 maximum aperture on the Sony 90mm is adequate. In an ideal world this lens would have a wider maximum aperture, but that would without a doubt have added to the price and weight of the device. The f/2.8 aperture has proven to be sufficient for all my needs thus far. Achieving great looking bokeh and depth of field is easy at the lower f-stops and the end results are awesome. The bokeh on this lens is amazing, as seen in the soft blurry background of this flower closeup below. Even at f/6.3 you get great looking depth of field for super closeup subjects. While the 90mm macro does have an auto-focus mode, the manual focus feel doesn't suffer from it. Manual focus on this lens is smooth and precise. The lens has a handy sliding ring that can quickly switch between auto and manual focus modes, a three way focus range selection switch, and a focus lock button where your thumb rests. For macro photography I use manual focus the vast majority of the time. While I've found that the auto-focus on this lens can be a bit slow to lock in on the area you want in focus, I've read this may be due more to my a7ii camera body than the lens itself. Since I don't plan on doing any action photography with this lens the auto-focus has been sufficient for when I have used it. But I use this lens for macro photography in manual-focus mode almost exclusively so this small auto-focus deficiency has been at the worse a minor nuisance and at best more than sufficient to the job done. I didn't buy it to take photos with auto-focus and I assume you wouldn't either. Sony's auto-magnify feature when manual focusing is essential for my macro photography work flow. With the camera's small screen it would be a shame to get back to your computer only to find your best macro photos are every-so-slightly out of focus. I have actually disabled the auto-magnify feature on my Sony in favor of a custom button mapping on the AF/MF switch's push button. This allows for two separate levels of focus magnification when pushed. I really prefer having this wired to the push button instead of it auto-triggering when focusing. I have found this gives me way more control over when I engage focus magnification, how far I want it to zoom, and allows me to easily move around the field of view while zoomed in. Since I use a variety of lenses and often want to manual focus without zooming-in, I have found this setup ideal for multiple scenarios. For most macro photography you'll want to use a tripod to mitigate your body movement, however the built in Optical Steady Shot in both the A7 body and the lens itself make it possible to get amazing macro photos hand held. I had my skepticisms that macro photos could actually be taken with this combo but I put it to the true test on my Joshua Tree backpack because I didn't want to lug a tripod. 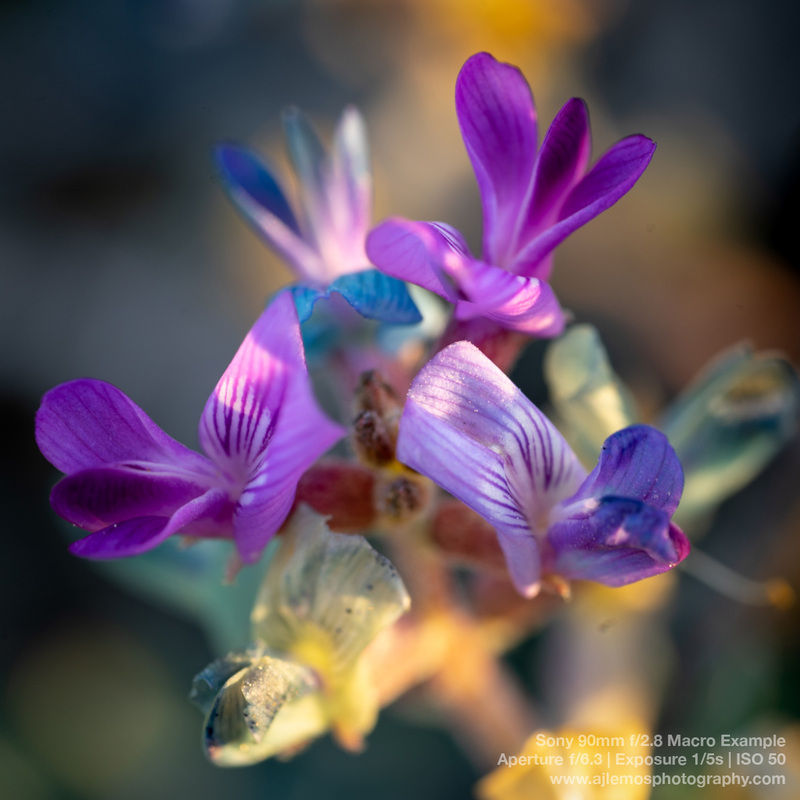 The desert cactus macro bloom below is an example of the amazing crispness you can get hand-held with this lens on a bright day, allowing you to leave your tripod back at the car and enjoy a lighter pack. The 90mm macro has a 1:1 maximum magnification ratio. So at maximum magnification the image is captured at life-size. For example, if your subject is exactly 35mm wide, it will fill exactly the entire width of your 35mm full frame sensor. This means things will be bigger than life printed or on your computer monitor. Such an extreme magnification means you are going to need to get really close to your subjects. This is called working distance. A comfortable working distance is extremely important for a macro lens. The increased working distance on the 90mm was one of the primary selling points for me over the 50mm. To achieve 1:1 magnification with the 50mm you need to be about six inches away from your subject (0.53 feet). Bugs and small critters will often flee for their lives before you stand a chance of getting this close, framing the shot, and locking all your camera settings in. With the 90mm you can get the same magnification at about a foot away (0.92 feet). While the difference doesn't seem like much, the extra distance will save your back and allow you to magnify a flower or bug that will likely be just out of reach with the 50mm. When I originally started researching macro lenses I wanted a lens with a 100mm focal length or greater precisely for the increased working distance. This silly 10mm deficiency had me thinking long and hard about the other E Mount lenses on the market. In the end, though, I decided the 90mm would be satisfactory. A few inches of working distances was a small sacrifice to make for the awesome quality and flexibility of this lens. 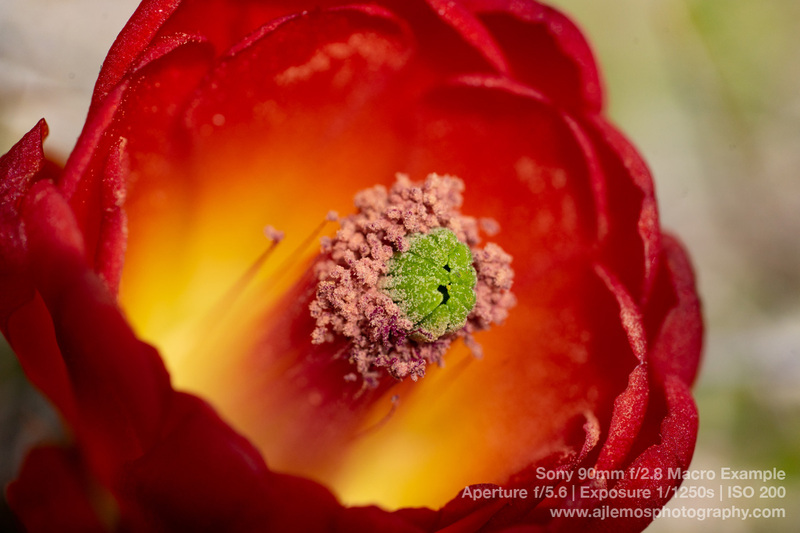 If you want to get into macro photography and you have a full frame Sony body this lens is your best bet. That is, if your pocketbook can handle it. Coming in at around eleven hundred dollars the price tag on this toy is no joke. I went all out on this lens mainly because I have decided to go with the Sony full frame E Mount for my kit. I'll likely upgrade my camera body multiple times before I ever replace this lens, so in the log run I feel the quality was worth every penny considering it should last a lifetime.